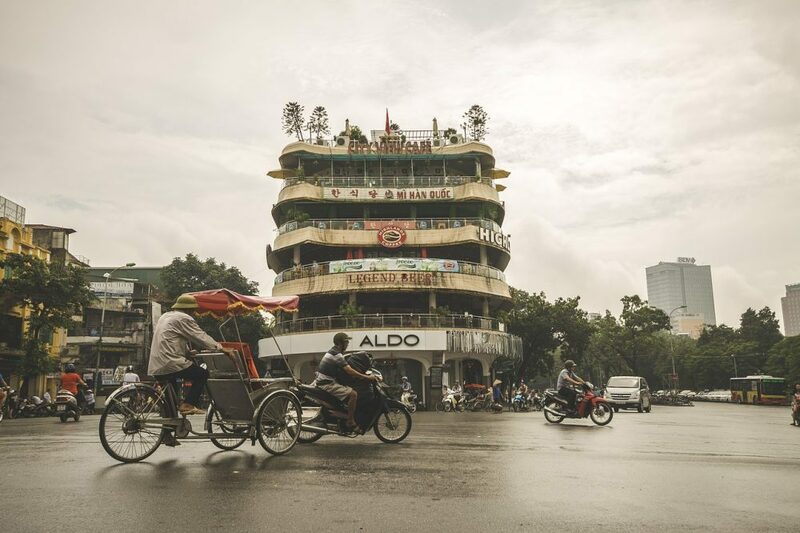 Hanoi Old Quarter is a long-standing urban area located outside the Thang Long Imperial Citadel. Here formed characteristic streets in order to support small-scale industry and commercial trade. In the past, each street had shops which only sold the same particular goods; for example, Hang Bac (Silver) Street only has silver shops. Nowadays, only some streets still keep their traditional jobs, but the others still retain the traditional beauty of the city. Below is the Hanoi Old Quarter Map and detailed guidelines for hunting treasure in the old urban city. The term “36 streets of Hanoi” is an inaccurate way to name the Old Quarter, since those 36 streets are both inside and outside of the area. Some streets are in Hanoi Old Quarter but aren’t listed in “36 streets of Hanoi”. 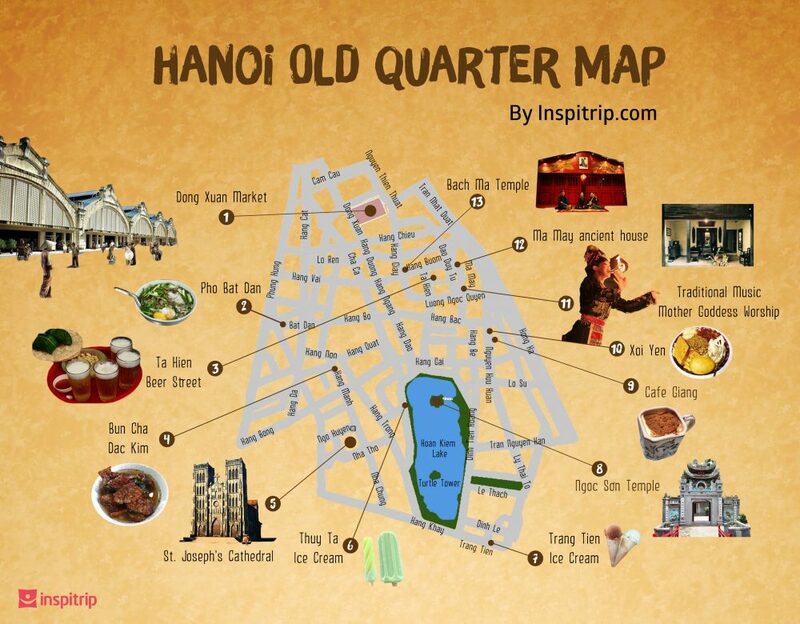 Hanoi Old Quarter map with highlighted attractions. Download the more detailed map to use on the move here: Link. Lacaito Homestay (2 Da Tuong Street, Hoan Kiem District, Hanoi): The homestay only has two rooms, one small room for two people and one bigger room for a group of four. It has a small garden with many kinds of trees and a clean, nice kitchen. The price is around $35/night. Momento Homestay (48A Trang Thi Street, Hoan Kiem District, Hanoi): The homestay is close to Hanoi’s night weekend market and Hoan Kiem Lake. It has a vintage atmosphere with many ancient family objects and heirlooms. Momento has 4 rooms, each following differents styles: Hanoi 90’s, Hoi An, Sapa and Garden. It also has a living room for visitors to read books and drink tea in a calming atmosphere. The price is around $36/night. 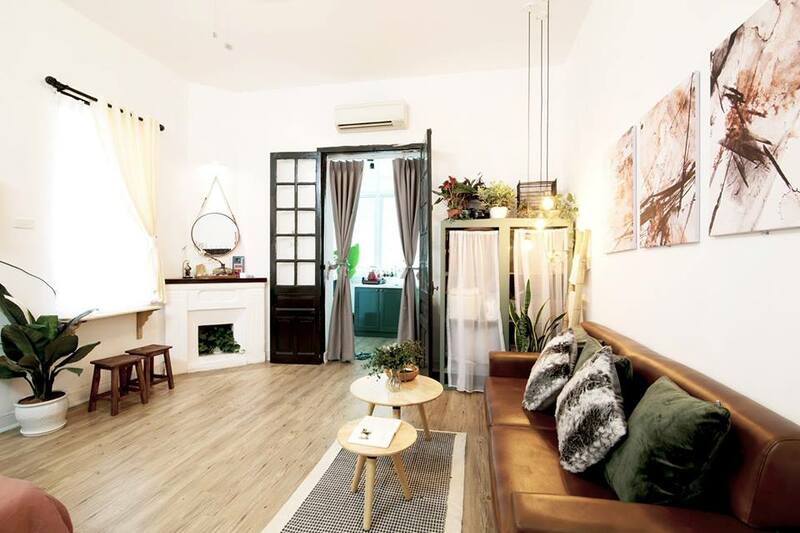 Cuc Cu Homestay (4 Vong Duc, Hoan Kiem District, Hanoi): A pretty and ventilated homestay which is located inside an old apartment. The natural and simple beauty of Cuc Cu Homestay brings about the most comfortable feeling for visitors. Note: Book the homestays as soon as possible since the rooms are limited. A very good choice for budget travellers or visitors who travel alone is cheap, convenience hostels. Gecko Garden Restaurant/Hostel (117 Hang Bac, Hoan Kiem District, Hanoi): The hostel is near to some of the shopping streets including Hang Ngang Street, Hang Dao Street and Hang Duong Street. The nightlife at this hostel is busy and dynamic with good music, delicious food and cheap drinks. A day here costs $6. 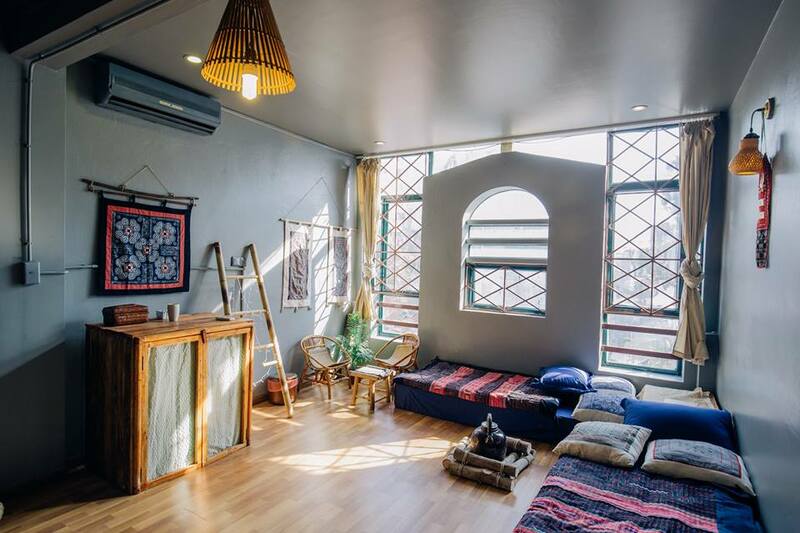 Hanoi Backpackers Hostel – Downtown (9 Ma May, Hoan Kiem District, Hanoi): The hostel offers a variety of choices for travellers, from couple beds to female single beds. It’s located near an airport shuttle stop, close to delicious street food, cheap fresh beer and pumping bars. The price of a nights stay is around $8.5. Bus: Bus number 86, a premium bus, has both English and Vietnamese broadcast systems. The price is $1.5 and it takes 1 hour. Avoid other normal buses including Bus number 7, Bus number 17, Bus number 90 which are usually overcrowded and the driver assistants may not speak English. Taxi: It costs you around $20 for a journey from the airport to the city centre. Here are some Hanoi taxi brands: Taxi Group (0438.26.26.26), Hà Nội (04.38.53.53.53), Taxi HaNoi Tourist (04.38.56.56.56), Taxi Việt Thanh (043.563.6666), etc. Uber/Grab: Grab is a platform like Uber, it’s more popular in Southeast Asia. If you’re travelling alone, order Uber motor and Grab bike for lower costs and an interesting road trip. Bear in mind that it may be hard to find Uber/Grab motor from the airport in cold weather. Rent a motorbike: You can rent a motorbike directly at hostels/hotels’ receptions or ask receptionists to help you rent one. Normally, renting a motorbike in one day costs you $3. Getting a motorbike can help you travel more conveniently, independently and decrease the cost. However, finding a place to park your motorbike at some highlights of Hanoi might be difficult and expensive. Uber/Grab: They’re cheap and almost always available. Prepare Vietnamese cash and tip the driver if you want. Cyclo: Cyclo has been a common means of transportation in Vietnam for decades. Nowadays, it’s used in tourism. It’s an one-of-a-kind experience to observe the city on a cyclo, at your own pace. The biggest cyclo brand in Hanoi is Sans-Souci (which means ‘No Worries’) with 160 cyclos ready to go. Call them at: 043 9281 248. Get a local friend and ask him/her to drive you around the city for private and authentic experiences. Hoan Kiem Lake: Hoan Kiem Lake, which means “Lake of the Returned Sword”, is named after a tale that a Golden Turtle God lent the Emperor Le Loi a Magical Sword to help him protect to country. Hoan Kiem Lake is where Le Loi gave back the sword to the God when the country is in peace. Large soft-shell turtles have been sighted in the lake many times, they’re a spiritual icon of the Hanoians. In the heart of the lake lies a Turtle Tower which is small and ancient, adding to the lakes charm. Around the lake is a green park, you can see many locals come here to hangout, play music, paint, play chess together and so on. Ngoc Son Temple (No.8 in the map): Ngoc Son Temple is located in a part of Hoan Kiem Lake. 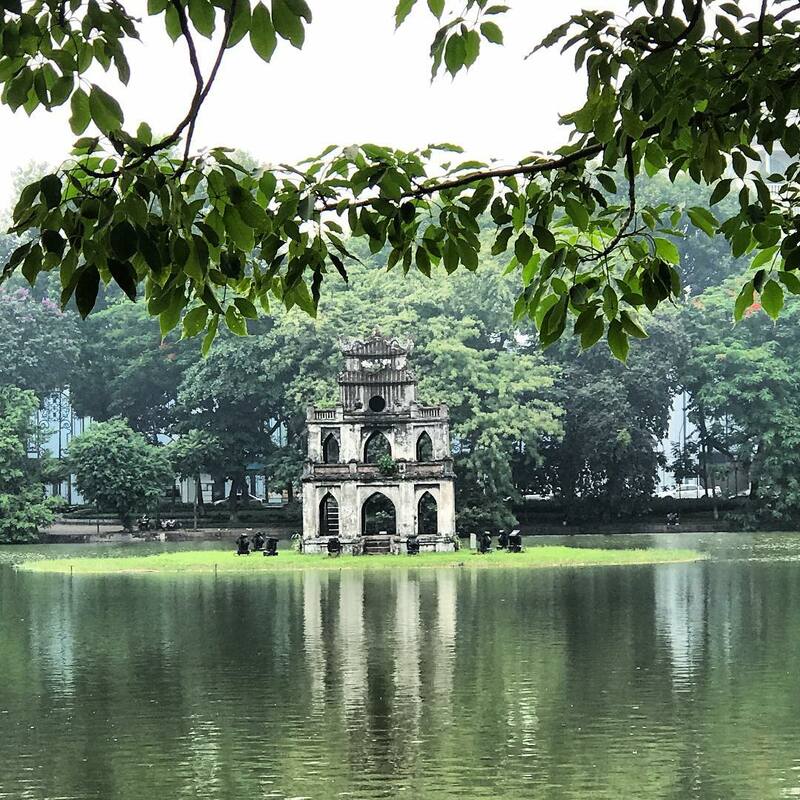 Here you can discover the religious culture and the history related to the tale of Hoan Kiem Lake. One of most beautiful parts of Ngoc Son Temple is the wooden red-painted ‘The Huc Bridge’ (The Huc means “Morning Sunlight”). Dong Xuan Market (No. 1 in the map): Dong Xuan Market was originally built by the French administration in 1889 and has been renovated many times up to now. It is a covered market where wholesale traders sell clothes, household objects and trivial things. The market is a great place for visitors to buy souvenirs and unique handicrafts. Ma May ancient house (No. 12 in the map): Located at 87 Ma May Street, the ancient house was built at the end of 19th century with the typical architecture of the time. Though it has been restored, the house reflects the traditional architecture of Hanoi’s Old Quarter houses: a narrow facade, yellow walls, wooden pillars and stairs, with the bathroom located at the far end of the house. Visitors can try some traditional food and buy souvenirs in the house. St. Joseph’s Cathedral (No. 5 in the map): The oldest church in Hanoi, St. Joseph’s Cathedral is the first building of French colonial government in Indochina. Built in Gothic Revival (Neo-Gothic) style, the church has a mysterious look. The cathedral is located in the end of Nha Tho (Church) Street, near numerous restaurants and small apartment blocks. Pho: The best known dish of Hanoi, Pho comes in two varieties: Beef Pho and Chicken Pho. In Hanoi Old Quarter, you can have beef Pho at 10 Ly Quoc Su Restaurant (the name is also the address), Bat Dan Restaurant (49 Bat Dan Street) or try eating Pho like a local in the street side of Hang Trong Street (1 Hang Trong Street). Some famous chicken Pho restaurants are Hang Dieu Restaurant (1 Hang Dieu Street), Hang Bun Restaurant (13 Hang Bun Street) and so on. 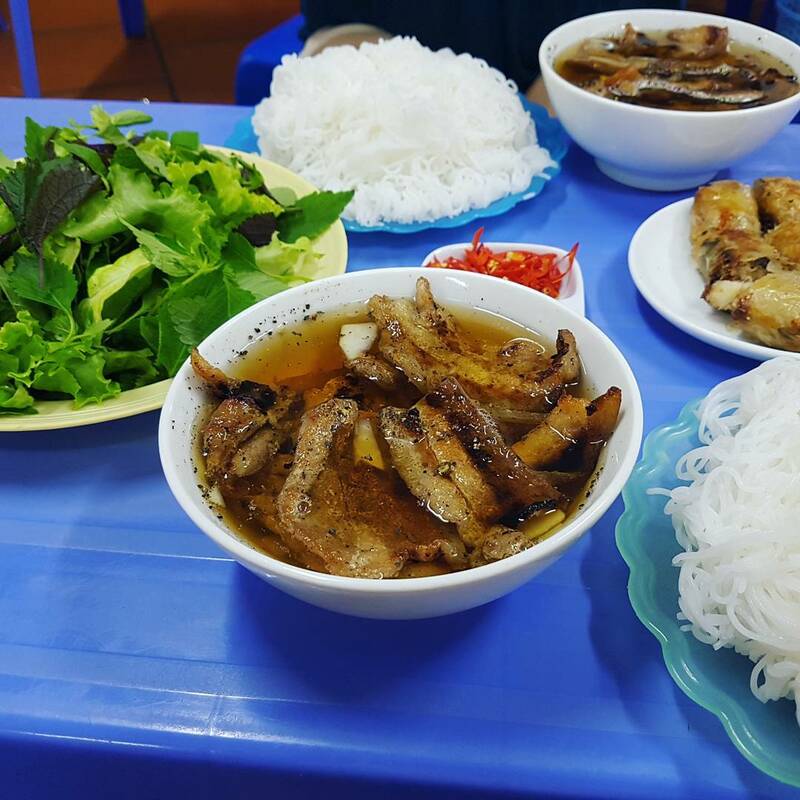 Bun cha: Bun cha is a special dish of Vietnamese cuisine; it’s the only dish having grilled meat in a bowl of broth. After President Barack Obama had bun cha for his dinner in Hanoi, the dish has become more popular with foreign travellers. Some of the best Bun cha restaurants are Dac Kim Restaurant (1 Hang Manh Street), Hang Quat Restaurant (74 Hang Quat Street) and Co Nga Restaurant (Dong Xuan Market). Don’t forget to order a fried sea-crab roll, it’s the most appealing part! Xoi (sticky rice): Xoi is a traditional food of the Vietnamese which has two varieties: Sweet and Savoury. Most of the famous Xoi restaurants in Hanoi serve Savoury Xoi with fried eggs, Chinese sausage, brined pork, chicken and paste. Best Xoi in Hanoi Old Quarter: Yen Restaurant (35B Nguyen Huu Huan Street) (No. 10 in the map). A box of Xoi of Yen Restaurant is big and it’ll keep you full for longer time than other dishes. Bun dau mam tom (fermented shrimp paste): Bun dau mam tom is a rural food of Northern Vietnam. A tray of Bun dau mam tom includes rice vermicelli, fried tofu, pork, chả cốm, raw vegetable and shrimp paste. Mam tom (fermented shrimp paste) is blended with kumquat juice, sugar and chili peppers, creating a very special taste of salty, sweet, sour and spicy. Xeo cake: This crispy pancake is named after the sound of rice batter pouring into a hot pan (“xeo” means “sizzling”). A Xeo cake is filled with bean sprouts, shrimp, thinly sliced pork and green onion. Xeo cake is a traditional cake of the Vietnamese, around the country it comes in different sizes, spices and types of sauce. 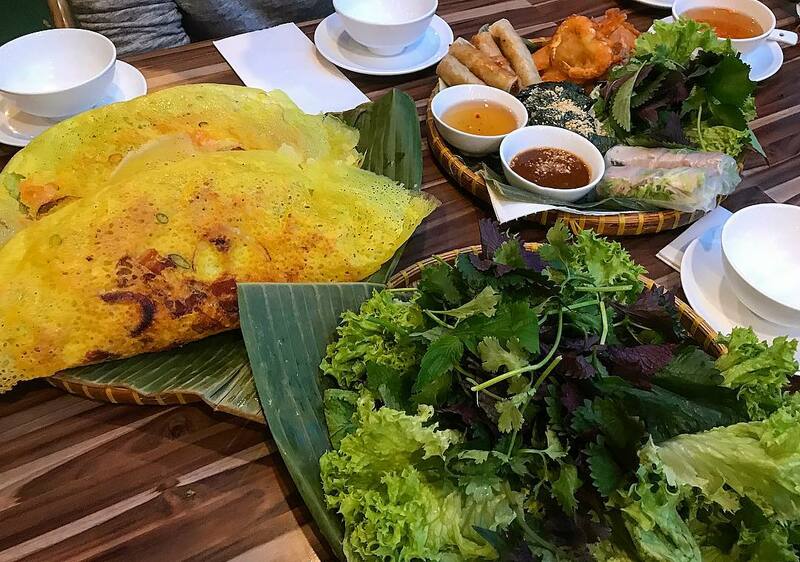 For the Xeo cake of Hanoi, eaters will slice a Xeo cake into 3-4 small parts and wrap them in rice paper with different kinds of raw vegetables. You can choose between two different types of sauce: fish sauce or “leo” sauce (made from pork liver and soy sauce). The best Xeo cake in Hanoi Old Quarter: Hang Bo Restaurant (22 Hang Bo Street). Price: $2-$3/person depending on how hungry you are. Interested on hidden gems in Hanoi cuisine? Discover 10 of Hanoi’s special dishes recommended by a local. Giang Cafe (No. 9 in the map): One of 4 of the best Hanoi cafes in the old days, Giang cafe is the home of the legendary Hanoi egg coffee. For those who don’t like a bitter taste, egg coffee in Gian cafe comes with sweeter versions: cocoa flavour and matcha flavour. A cup of egg coffee is served hot and put inside a bowl of boiled water to keep the cup hotter for longer. The cafe has two brands, both attract many locals and foreigners to hangout here. Dinh Cafe: Located on the 2nd floor of an old French villa, Dinh cafe has a beautiful view overlooking Hoan Kiem Lake. The cafe owner, Miss Bich, is a daughter of Mr. Giang, the founder of Giang cafe so the two cafes have almost the same taste. Unlike Giang cafe, the egg coffee cups of Dinh cafe are not put in boiled water, so drink the cup quickly or it’ll become a bit smelly once it gets cold. Old Town Cafe: As it’s a hidden cafe, you must go through a narrow alleyway and pass some shirt and souvenir shops to find the coffee shop. Compared to other famous cafes, Old Town Cafe is far less crowded. It has a nice rooftop view, old-style decor and most importantly, a Garfield look-a-like fat cat. The cafe also helps you to discover how an early 20th century Hanoi house looked like with its old-style architecture and household objects. 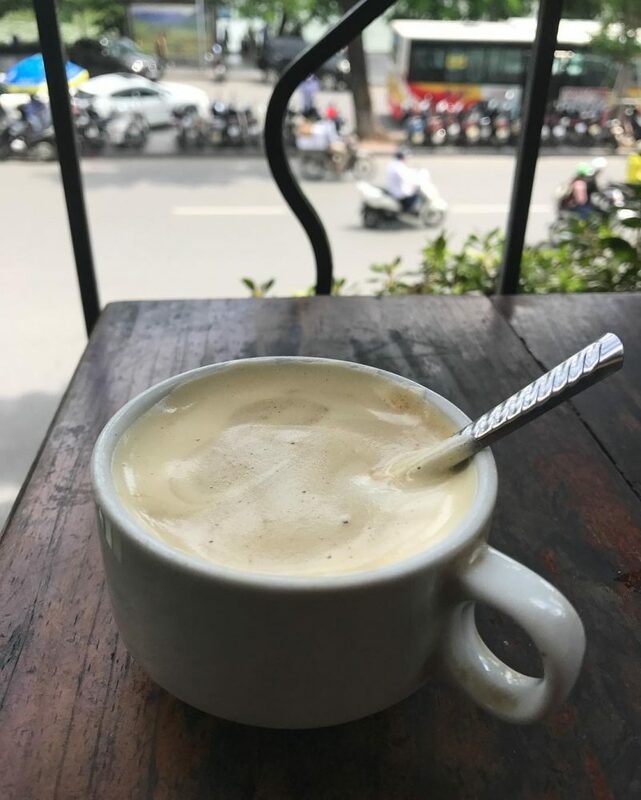 If you have time and want to explore more ways of experiencing Hanoi’s coffee culture, check out this Hanoi coffee guide. Besides, don’t forget to try your favorite type of ice cream at Hanoi Old Quarter. Hanoi is the only city of Vietnam which has nationally famous ice cream brands. Try out Trang Tien Ice cream (35 Trang Tien Street) and Thuy Ta Ice cream (6 Le Thai To Street) to explore why Hanoi’s ice cream is so famous. An ice cream lolly usually cost $0.5. The mint flavour of Thuy Ta shop is most highly recommended. Dong Xuan Market (Dong Xuan Street): Everything. Yes they sell everything here. Trang Tien Plaza (Hang Bai Street): Clothes. It’s better to have a local to go shopping with you so he/she can help to barter with the shop owners. Ta Hien Beer street (No. 4 in the map): Located near Hoan Kiem Lake, Ta Hien Street is one of the most crowded places in Hanoi Old Quarter at night. The special dish of Ta Hien Street is fresh beer accompanied by savoury food and snacks. The street is fraught with mini bars, restaurants and numerous people sitting in tiny plastic chairs and drinking beer. Locals, expats and tourists love to hangout on the street to enjoy its lively music and busy nightlife. Night Markets: The most famous night market of Hanoi is the Old Quarter market which is held every Friday, Saturday and Sunday. You can buy anything from winter coats to summer shorts, a whole range of accessories and delicious street food such as grilled pork or spicy breadstick at very cheap prices. The market is quite large, from Hang Dao Street to Dong Xuan Market. 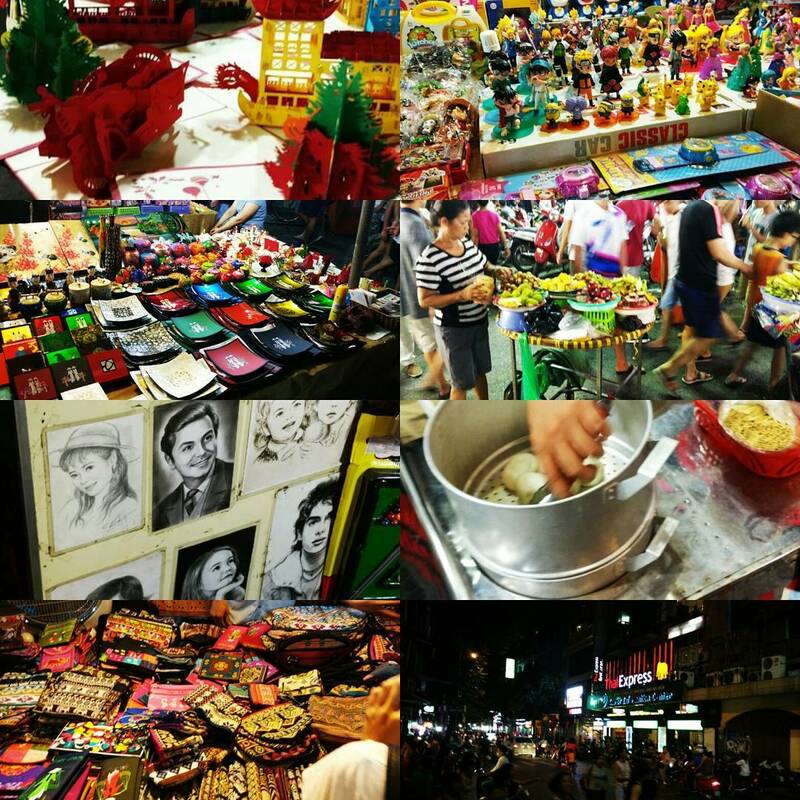 Therefore some stalls sell the same types of goods, make sure you choose the best goods. Park your motorbike (if you have one) on the roundabout close to Hoan Kiem Lake, you’ll pay $1 for parking. 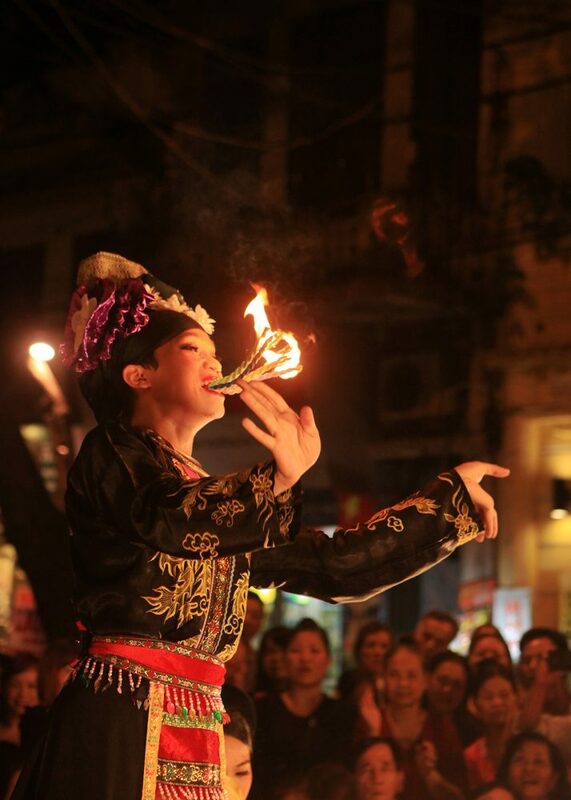 Street Art: If you’re interested in Vietnamese traditional performance, Hanoi Old Quarter is the best place for you to experience the old treasures. Head to the Bach Ma Temple (No. 13 in the map: crossroad of Hang Buom Street and Hang Giay Street) to listen to Xam singing, Ca tru, Chau van, etc. In the dynastic time, Xam was usually performed by blind artists wandering from town to town to make their living. Ca tru, a geisha-like form of performance, is a kind of chamber music performed by female vocalists. Chau van is a folk art combining singing and dancing, it’s a combination of music, poetry, rhythms, pauses and different tempos. 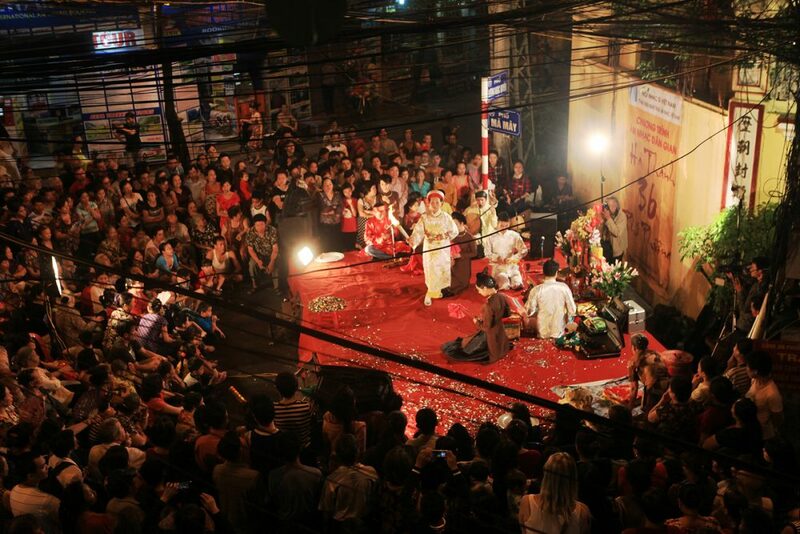 Dao Duy Tu Street, Ma May Street, Hang Giay Street, Luong Ngoc Quyen Street: Street artists perform instrumental music that combines traditional and modern material. The crossroad of Luong Ngoc Quyen Street and Ma May Street (No. 11 in the map): Artists perform traditional music reconstituting the Mother Goddess Worship, a very popular belief of Vietnam that has been recognized by UNESCO. 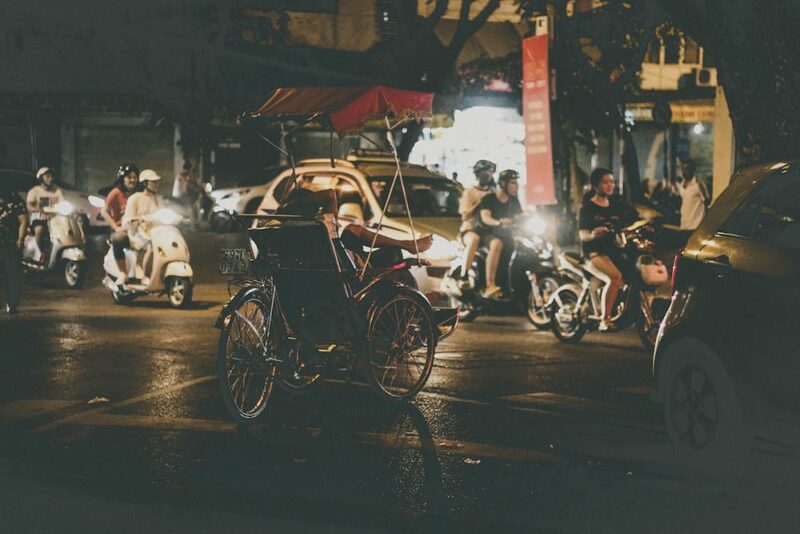 All the highlights of Hanoi Old Quarter are put onto the map. 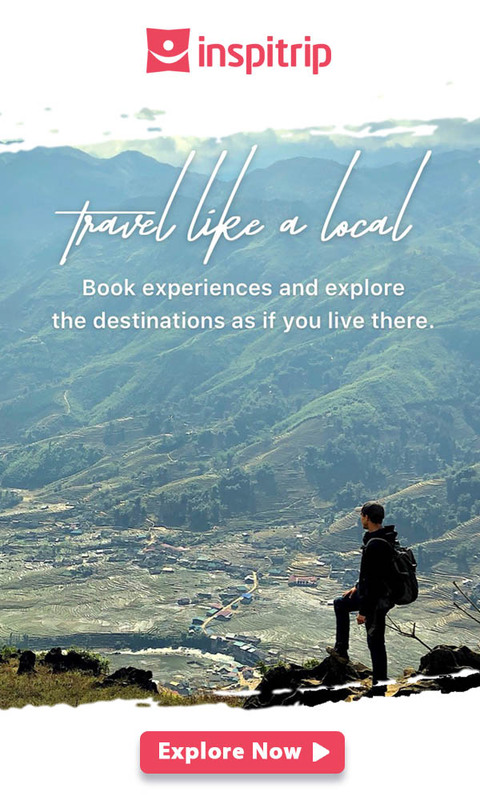 Just download it and start to plan your days in Hanoi. Have a great trip!